If you find yourself pressed for time while sightseeing in a big city, why not consider a running tour? Hotel accommodations in a location surrounded by parks, sites and trails can offer more benefits than just cultural stimulation. To get the most from my brief London visit I turned to the Red Carnation Hotels, a UK company with six charming properties located throughout the vibrant city’s neighborhoods. My first choice, The Rubens at the Palace, was perched directly across from Buckingham Palace, so the location alone was tops for tourista ramblings, and I was really excited to find out that the hotel provides Sports Buddies. The program is a unique service where hotel managers can reserve time with a guest to be a playing partner on a sports outing like cycling, jogging, and even horseback riding. You can partner with someone who knows the area’s best routes. How perfect, right? Unfortunately they were sold-out for my visit dates. Luckily my second choice came through and it turned out to be a gem of a “very British” property. 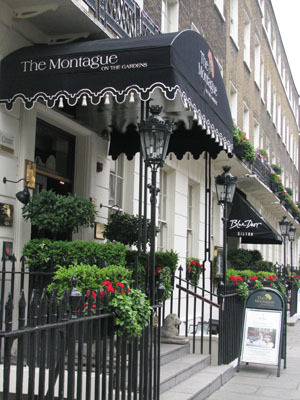 The Montague on the Gardens was still in Central London but far enough away from the crush of tourist crowds that it felt like a true retreat. Settled into a quiet side street next to the renowned British Museum of Art, the hotel has a residential vibe. Although The Montague didn’t offer a Sports Buddies program like their sister hotel, the concierge staff mapped out a few jogging options, noting special sites, and emailed them to me ahead of my visit with links describing the routes. The helpful staff also recommended a bona fide running tour company specializing in customized and group running and jogging themed tours of London. 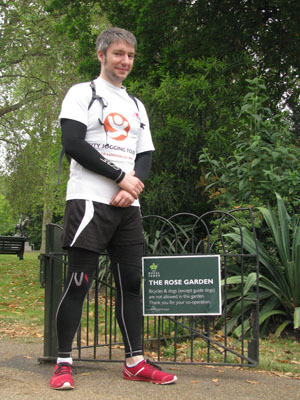 You can sign up for themed group tours or plan a customized run with City Jogging Tours within Central London. For solo travelers either option is a great choice, and you can make a few new friends jogging along tourist sites or get some one-on-one time with a running guide that matches your pace. I set up a customized tour that worked with my tight schedule. James, my guide, was right on time waiting for me in the lobby of the Montague at the Gardens. The customized option allowed me to request the meeting location rather gather at the set group location. We immediately set off jogging from the front door warming up the leg muscles while James reconfirmed the route I wanted to see and suggested a few shortcuts — another benefit of running with a local who knows the ins-and-outs of the city. “You run through SoHo, Westminster, all the shopping districts, you could do that in an afternoon, really. London is not an enormous city. Obviously it does spread out into suburbs but central London is not that big,” he said as we matched our pace to a comfortable level so we could talk. We bypassed clogged busy streets and zig-zagged along sidewalks of back alleys and side streets within charming and eclectic neighborhoods. At one point James thrust out his arm in front of me preventing me from crossing the road right before a bus zoomed past. He quipped, “One thing you have to watch out for depending which country you are from…is the road crossings…lots of people look the wrong way.” He added, “Don’t worry you will be safe with me. A lot of people that come over from overseas value the history of London but they also value the insight of the local London tour guides.” A comforting thought as I paced myself beside him, a little more wary of stepping off the side of a curb. Since our route led to the Royal District and Buckingham Palace, I asked him for tips on routes close to my hotel which was located at Russell Square and King’s Cross. He suggested heading toward the Bohemian area of Camden also known as a music area, and all the way up Camden High Street to view the unique and unusual markets along the way. There was a lot of construction going on due to the Queen’s Jubiliee and the Olympic Games — Union flags and decorative red, white and blue bunting colorfully draped buildings across the city. James informed me that he had planned a 7 kilometer route for us that finished at the Albert Memorial near Kensington Hyde Park. We head past Charing Cross Road and Oxford through SoHo Square Gardens, Chinatown and then onto Trafalgar Square into the Royal District. He gave me a few running tips, saying, “I’ll stop jibber-jabbering and pause as we are now running next to the National Portrait Gallery which is absolutely lovely.” We stopped momentarily and I snapped a quick pic before continuing our run. Because there were so many things to look at and take in while we were running, I didn’t feel tired. In fact, I felt more energized. The closer we got to the Royal District the more frenzied traffic became, which made me glad we were on foot. As we headed into Trafalgar Square, James informed me that “there is nothing more representative of London and the British Empire than the area that we are heading into now. This is my favorite part by far. The most prolific part of the British Empire was the Victorian Era. During that time two-thirds of the the world’s land mass was British. After the Battle of Trafalgar with the defeat of the Spanish and French in 1805, the Royal Navy was unrivaled and the British Empire expanded massively.” This was just one of the many factoids that James produced along our tour. Sure, I could have listened to a phone app tour that might have told me the same thing or brought a guide book with me, but the point was to run and not stop, getting exercise while touring. A typical customized tour can run 2 – 3 hours while a group tour is about 1 1/2 to 2 hours of running time. We saw everything that was on my list and more. I know that I could not have covered as much on my own as fast as I did without the guidance of James, my very knowledgeable running guide with London City Jogging Tours. He even brought me to the nearest tube station and assisted me with the purchase of a ticket, offering a few tips to get back to my hotel. There’s is nothing like a friendly local who can talk up the sites while running with you according to your own interests and time schedule. The jet lag? It became just a memory. In four hours I saw more of London than most people see in a full day, plus I got some good exercise before taking the train onto my next destination that evening. www.VisitLondon.com is a great comprehensive resource for travel to London.